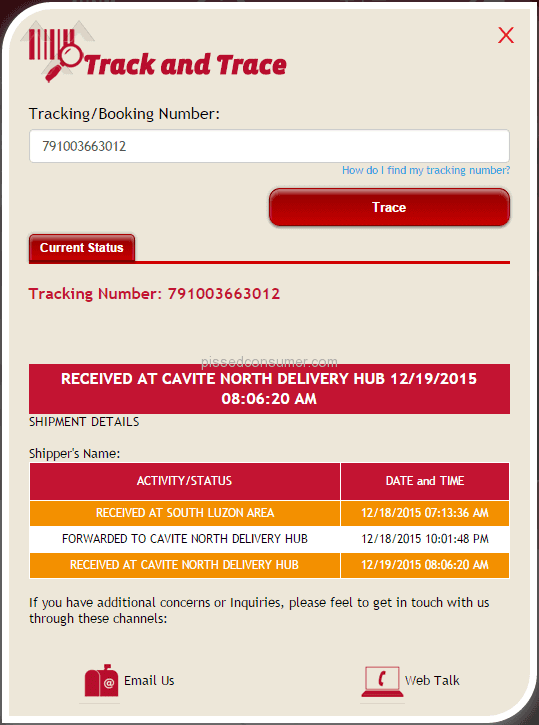 LBC Express - Pls update youre online tracking..
Sana e update lagi abg tracking website niyo pls..
LBC Express - Never received my 2 boxes and can not even contact LBC by phone or email. i have a concern,it's about one of your Cargo Associate here in our place in Iligan. i received a text from your company and it says that my transaction is pending and i am advised to call one of your hotlines or visit your website. so, me, i was worried because i can't even remember that if you make a transaction process,especially for pick-up,you will receive a text that will inform you that your transaction is pending because for some reason.sorry,but it's been a long time since I've made such transactions,i already forgotten the process. so i called one of your branch here,so that i will be ease because i was worried that there may be some errors on my transaction. so someone answered, a woman, i told her that i received a text from your company,then she asks me "what number? ",that time her tone was rough,i can feel that she's not in the mood for entertaining customers. so,i told her that there is no number registered on my phone. suddenly she told me that "how come someone texting you without a number?". as i was listening, i was shocked,i checked my phone again then i told her that there is no number,only the name of your company,LBCExpress. she's so mean while answering me,she has no proper etiquette. i was just clarifying myself because as I've said it's been a long time,it's new to me. so she told me, "the text was clear,right ma'am? that your transaction is pending because the receiver didn't claim it yet." i was shocked the way she treated me, i was disappointed in the way she acted that time. because i don't want an argument via telephone,i just nod my head and said yes it was clear.i was like,God, speechless. why? i know,there is no problem on the way i treated her. she's so mean. please do consider my concern, this is my first to encounter such as this. thank you for sparing some time reading my concern. thank you! Very poor customer service. You can't get an answer from them on both of their Facebook acct and twitter regarding an update of your transaction. Very slow delivery too. There website is a mess too. Tang ina nyo lbc ung order ko sa lazada wla pa hayup kayo! I was expecting a package to be delivered between December10 and 12, waited at home all day on December 12, website showed out for delivery, then!!...nothing!! Lbc website shows " Delivery Failed". House closed?? We've been home all day! They could have asked at the clubhouse or even the guard at the gate might now as my block is straight in from the gate on the left side of the street. How incompetent! Now it's been on it's way for 14!!!!! days!! and still counting. Unbelievable!!! Manila to Iloilo! Avoid Lazada and LBC at all costs.